are difficult to find pleasant. among whom one feels no companionship. the deluded pursuit of pain? These words really hit home after an extended stay at Abhayagiri Monastery in Redwood Valley, CA. I am deeply drawn to monasticism, and it is with some sadness that I observe either an unwillingness or a perceived inability to commit to such a path. At the same time, I am very committed to sharing whatever wisdom develops from my practice with those around me, especially those who may not have access to the Dhamma otherwise and, it certainly seems that mine is a path of practice in relationship, at least for now. It would be ideal if I could live within close proximity to a monastic community such as the one at Abhayagiri. Unfortunately, I currently live 2,600 miles (or ~4,200 kilometers) away. Not so close for regular visiting. Better than going to Burma. But still, not really practical. There is no doubt that I could be far more isolated from Dhamma than I am in rural Connecticut, however, my experience on this trip really emphasized the (relative) importance of form and a feeling of connection to a particular tradition; and, as far as the Thai Forest tradition is concerned, we are sorely lacking here on the East Coast. Not surprisingly, as I got in the car to drive home from an overnight at my sister’s — who lives near the airport — the reality of being back in the world manifested as a heavy feeling in the solar plexus, a looming depression. My behavior reflected this and I found myself regretting some words and actions that morning. The loneliness of the re-entry contrasted greatly with all the time spent in Northern California. Although my approach in theory is very nonsectarian, and I so often hesitate to identify in religious terms, put me in a Theravadan Buddhist environment replete with early morning chanting and obligatory respect to senior monks (anjali), an ascetic monasticism, and I thrive. I find there is so much power in the form and ritual. I have always been very anti-authoritarian (a story is all it is, but one deeply believed) and it has consistently created issues for me, in boarding school, at work…and undoubtedly there are things I bump up into in a hierarchical environment, particularly gender stuff when those I’m paying respect to are all men. Mostly I feel mudita, but there are elements of envy and resentment there too. On the whole though, being in a lay-supported community of contemplatives engenders a deep sense of gratitude more than anything. When I was on retreat in Burma this past December, I met another American who was there and we developed a rich friendship over a week or so, due to several very poignant practice-related discussions. My arrival to California was shaped largely by this friend and his partner welcoming me into their home where they had been preparing food all day. The next morning we woke up early to drive three hours north to the monastery where we would offer the food they prepared and share in the monk’s one meal a day. I realized I had left my hiking boots at the apartment in Oakland, and immediately S offered me the shoes on her own feet. She made the return trip barefoot, and squeezed her feet into my smaller boots to get herself back home to San Francisco. Such small acts, but so much heart and generosity. Within several days of being at the monastery, I witnessed two ordinations — of both an anagarika and a samanera. In the Ajahn Chah lineage, going forth is not taken lightly, so it was incredibly moving to be present for these vows. A few days later, a Thai woman and her mother came to stay for the week in honor of the younger woman’s son, who died at the tender age of 10 five years ago. Just before he became very ill, he was allowed to temporarily ordain at Abhayagiri (an unusual exception for unusual circumstances) in the hopes that the good kamma of becoming a monk would influence his chances of survival. It felt incredibly auspicious to be present for both of these events. And my gratitude only continued to deepen. This is not to mention the impact of the steady stream of visitors, long-time supporters either in material terms or service/time — many Thais who travel long distances because of their devotion, because of the dedication to practice of this community. Also, converts who have made a home of this sangha, who joined us for sittings and the Dhamma talks, and whose names I saw in the acknowledgments of many of the monastery publications. Rich teachings offered freely. This kind of mutual support is so compelling. I felt welcomed right away, despite often being the only woman around a bunch of celibate men. Completely taken into the fold by the abbot Ajahn Pasanno and the others. I worked hard, alongside the other laypeople and anagarikas while the monks also labored vigorously to maintain the property, provide audio transcriptions and produce publications, and so on. And outside of this work and community chanting and sitting (once in the morning and once in the evening), the rest of the day was open for me to practice in the way that suited me. No cell reception, no internet connection, only relevant reading material, a lot of quiet and forest and solitude. All Dhamma, all the time. This model is a beautiful one, where you come to take part in the community and nothing else is asked of you other than to do just that: work and practice (not separate). I find it inspiring and wonder if it will blossom or if we will find alternatives that incorporate more of the monastic (and Asian) than the lay (and Western) model of residential practice centers. 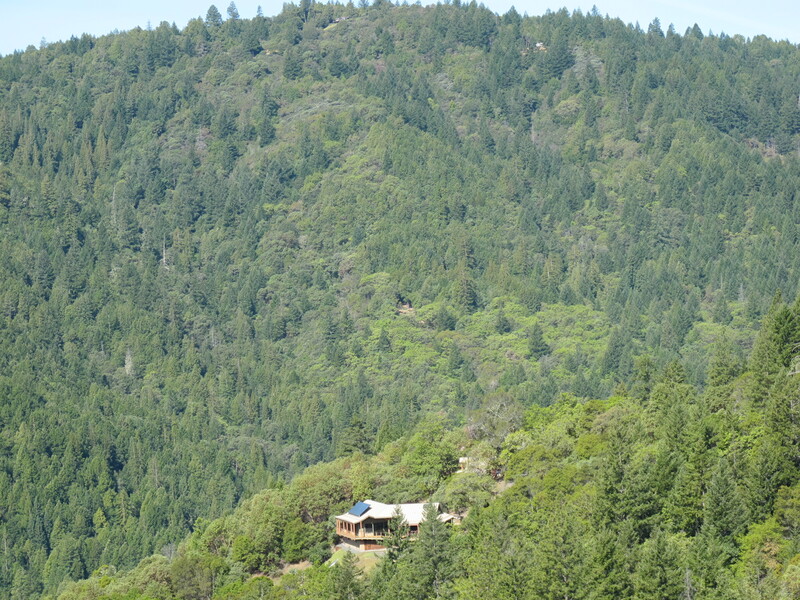 To complete the circle, I returned to the Bay Area to participate in a gathering marking the formal departure of Sisters Anandabodhi and Santacitta from the Forest Sangha since they intend to take full bhikkhuni ordination, which is not recognized in that lineage unfortunately. Again, timely for me. This move away from the known variable into the unknown is equally moving and, I trust that their dedication to practice and to equality will flower into something sustainable, which may alleviate the ache that a heart like mine feels even while surrounded by such wonderful community as Abhayagiri’s–just feeling that such an option is not available to me as a woman. Community is absolutely essential. It nurtures and grounds us on the path. The Buddha, Dhamma, and Sangha may be three but they are also a unity. I am also confident that this heart connection to a specific tradition is what has brought the practice into my life in an integrated way. As much as I can continue to benefit from the rich teachings of other traditions, including more secular applications, there is great confidence (saddha) in following a particular practice path and feeling such a home base as this. Deep bows to all those who allow the teachings to evolve and be their dynamic selves, while staying true to the essence. An ongoing and rewarding effort. Communal connection, tradition … interweaving with the practice. This was very thoughtful, sincere and authentic expression of something deep within you. I struggle with … others not understanding. Although I have never had the will/intention of living a monastic life … relationships – familial and otherwise – become complicated by others lack of understanding. Then I ask myself, “Do they really need to understand, or do I just need to live it … regardless?” I also just value being ordinary … with everyone. But, being misunderstood is something I always run up against. That question: do they need to understand or do I just need to live it? From what I can tell, if living it, understanding generally follows…not always, but that’s part of the natural process of finding the companions that best support us on our path. I certainly relate, however, to not wanting to be misunderstood. By the way, did you see this? Katherine, thank you so much for sharing your beautiful insights into your recent experiences. I was touched by them. Thank you so much Terry. I look forward to listening to the talk. Grateful for your role in my virtual but nevertheless very real community. Gratitude and spiritual friendship…a big part (I’ve heard maybe even all?) of the holy life. Thank you Kristen. Like you, I find that something just clicks for me in a Theravadan setting. Which is a little difficult for me right now, since my dhamma friends in the Bay Area are almost all Zen folks. (Even my last job had such a strong Zen component that I now have its complete version of the Heart Sutra memorized.) But posts like this inspire me to keep exploring, keep seeking spiritual community. Thank you so much for sharing! Welcome home, Katherine! And thanks for the gift of your inspiration, witnessing you walking in the Buddha’s footsteps as a modern woman in the 21st century. So curious to see how your path further unfolds . . . So beautiful. I find myself very moved by your words. I used to live at Abhayagiri as a bhikkhu, and they still feel like my long distance family :) The description of being ‘totally taken in’ by Ajahn Pasanno and the monks was especially moving. I almost cried.